A few weeks back, one of my best friends proposed we make dinner for our boyfriends and she suggested we make a homemade Indian dinner. It was simple to make, relatively inexpensive ($15), and when my boyfriend dug into his creamy butter chicken, he proclaimed that we didn’t even need to go to an Indian restaurant anymore to get tasty food! Although, of course, we will (in fact, I had Indian food from 309 Dhaba at the 1,000 Tastes of Toronto festival a week ago and the spicy chick peas were tasty). Looking to satisfy your Indian craving with a quick fix? 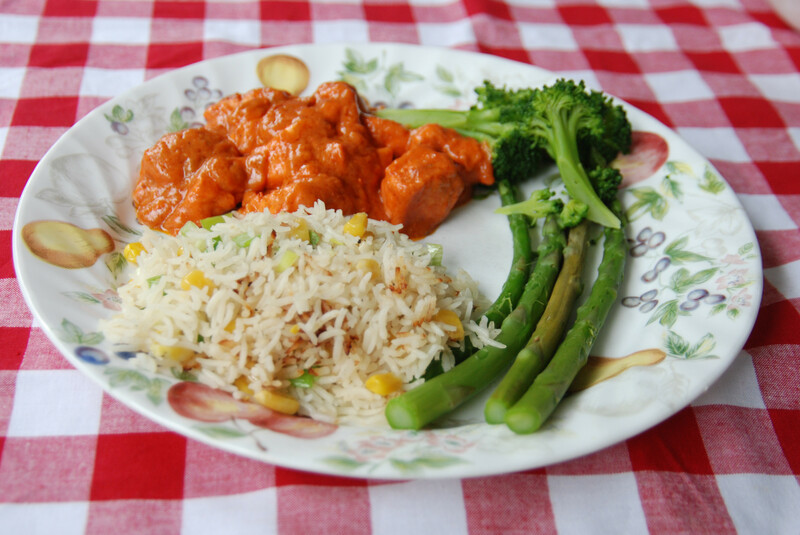 Prepare a well-balanced meal of rice and vegetables with creamy Indian butter chicken sauce. WARNING: The recommended butter chicken sauce contains, sadly, a chicken ingredient. So strict vegetarians should refrain from consuming this sauce. Unfortunately, I do not have a homemade sauce alternative but hopefully the international sauce section of your nearest grocery store has some tasty options. 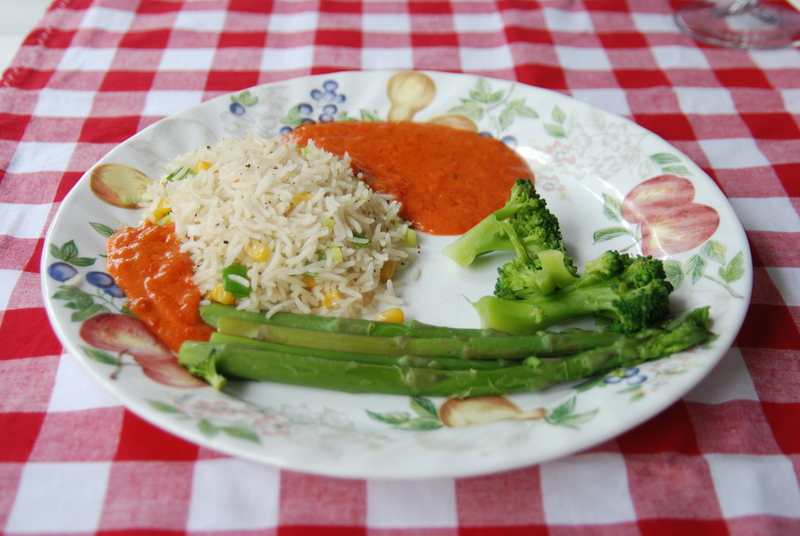 Mauritian rice and vegetables with creamy Indian sauce. *Warning: the sauce has a chicken ingredient. Fill a pot with water and rice. Add ½ vegetable cube to the water once boiling. 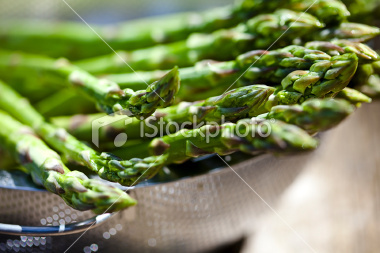 While the rice is cooking, boil water in a separate pot and add asparagus. After a few minutes, add broccoli. Broccoli takes less time to cook than asparagus, and by sharing the water you, obviously, save water. Remove once cooked (use a taste test to determine). Once rice is ready, add corn nibblets and chopped green onions and cook for two minutes. Meanwhile, if you’re looking to add meat for guests, prepare the chicken according to the butter chicken recipe below. If preparing the meal for a party or someone who eats meat, you may wish to add this concoction. Depending on your feelings towards meat, you may not want to make it yourself and may prefer to lend a sibling or family member the option. Cut chicken into cubed chunks. Heat oil on medium high. Lower heat to low-medium. Add chicken, cook until it is white on the outside, then flip. Add sauce and simmer for 10 to 15 minutes. When you slice the chicken open, it should not be pink! Note: Boiled vegetables lose some of their vitamins in the water. So unless you reuse the water later (for example, to make a soup) to recuperate the vitamins, you may wish to steam vegetables instead. This requires seating vegetables in a strainer, which then sits over the boiling pot of water. For a healthier 10-minute alternative to preparing asparagus, please see this asparagus and olive oil recipe. Do me a favour—do as we did and make sure your carnivorous guests consume their share of vegetables too!